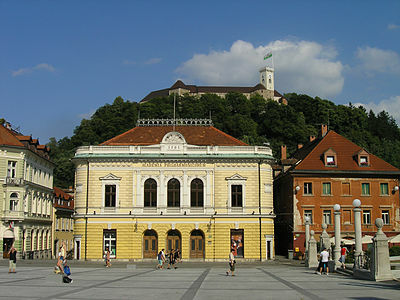 Ljubljana is Slovenia's capital and the largest city in the country. It is known for its university population and green spaces, including expansive Tivoli Park. The curving Ljubljanica River, lined in outdoor cafes, divides the city's old town from its commercial hub. Ljubljana has many museums, including the National Museum of Slovenia, displaying historic exhibitions, and the Museum of Modern Art, home to the 20th-century Slovene paintings and sculptures. The most pleasant way to reach all spots in the city is by foot. Old Town: the Old Town is squeezed between the Castle hill and Ljubljanica river. Triple Bridge (Tromostovje). Designed by Jože Plečnik. Tromostovje consists of three separate picturesque bridges located next to one another. The neighboring Prešeren square with the statue of Slovenian greatest poet France Prešeren is the central location of downtown Ljubljana and a common meeting point. Slovenia's 20th-century history museum gives you a real sense of the country's roller-coaster ride through regime after regime. Its immersive exhibits include a walk-through WWI trench.